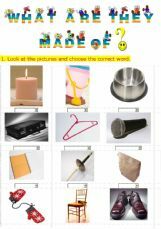 There is also another on-line exercise created by me - listening comprehension - "Dolphin Parenting" that refers to the same video and a full lesson that You can find in my printables. Enjoy! General business vocabulary. Choose the definition or a synonym. Very simple exercises for beginners. Linking words AND, BUT and BECAUSE. 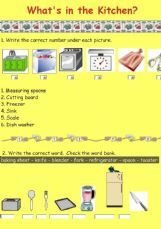 Easy reading worksheet to revise basic computer words for young learners. 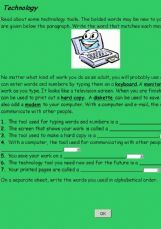 Students are asked to complete the net acronyms - very useful to teach students how to write e-mails. I have no kitchen at my house right now! It�s being redone and it will take two months to get ready! I must be thinking so much about kitchens that I prepared this OE. As soon as my kitchen is ready I will use it to cook with my private students. I already have aprons and chef hats for them - all I need is the kitchen. 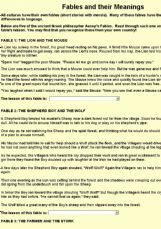 A reading exercise with questions to answer based on Aesop�s Fables. Read through the short fables and try to pick the correct meaning for each fable. 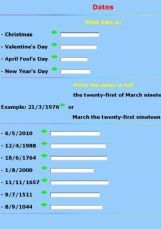 A good way for advanced English learners to test their vocabulary and reading comprehension. A very nice hangman game in wich the student should guess some parts of the computer using clues.